The critic James Wolcott is peeved. "Mitt Romney’s fateful decision this January not to pursue the presidency for a third futile time deprives those of us in the bleachers of a rare-ish opportunity to watch a representative of the 1 percent in plastic action," he writes in Vanity Fair’s April "special issue" on "the age of money." There are few chances, Wolcott avers, to observe in public a member of the financial and social caste that rules America. "It is not often we get to study how a scion moves, behaves, and simulates reflective thought under changeable conditions." Really? Wolcott could always flip through the ads for Secret Clinical Strength and Versace’s Eros Pour Femme to page 172 of his own goddamn magazine, where begins the article "Hobson’s Choice" by Bethany McLean. It is the best opportunity I’ve had in some time "to watch a representative of the 1 percent in plastic action." Trigger warning, though: None of the oligarchs mentioned therein is a Republican. "Hobson’s Choice" is a rather ironic title for this celebratory profile of Chicago investor and Democratic donor Mellody Hobson, since it is unclear whether in the days since high school she has ever faced a decision between something and nothing. Her most consequential choice seems to have been enrolling in Princeton rather than Harvard in 1987. John Rogers, the founder of Ariel Capital Management and a fixture of the Chicago establishment, was the deciding factor. A Princeton alumnus, he put Hobson in touch with Bill Bradley, the basketball legend and U.S. senator from New Jersey, who became another of her mentors. Upon graduation she took a job at Ariel, where she is now president. 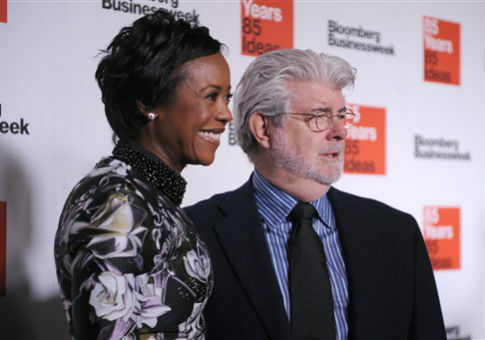 In 2013 she married filmmaker George Lucas, with whom she has a daughter. Hobson’s portfolio of investments, McLean writes, "is worth tens of millions of dollars." Lucas is worth $5 billion. Not struggling to make ends meet, those Hobson-Lucases. The character that emerges from McLean’s description of Hobson, I hasten to add, is sympathetic and winning. She was not born to riches and she has overcome the prejudices of others to lead a by all accounts successful and committed life. Clearly she is driven, a striver, a networker, a prodigious achiever who not only has lived up to every expectation the meritocracy imposes on young people, but has also flourished beyond them. What fascinates me is how liberal journalists like James Wolcott seem not to make room for Hobson and her milieu in their bilious descriptions of the "very rich." How enormously wealthy liberal Democrats might as well not exist, how for left-liberal writers the chain of association whose first link is "rich" inevitably includes "conservative" and "Republican" and ends with "bad." "The very rich are different," writes Wolcott, stating the obvious. "They occupy a different altitude, harbor different expectations, play by different rules, take different vacations, and apart from Warren Buffett, wouldn’t be caught dead downing a McDonald’s burger, despite their carnivorous natures." When I finished the profile of Hobson the word "carnivorous" did not cross my mind. Fortunate I thought, for sure, and earnest, too, but neither carnivorous nor any other description of eating meat, of consumption or another euphemism for avarice. Maybe I should read the piece again. Everything that bombastically unwinds on Empire confirms the adage attributed to Balzac that behind every great fortune lies a great crime. Respectability flosses the very rich once the crime is buried so deep that there’s no danger of its rising from the dead. At that point it’s safe to run for office, pretending to be one of the people, or enter philanthropy, generously giving back after all you’ve gorged. Now I know there are some jurisdictions in which the production of the Star Wars movies, and certainly that of the prequels, is considered a criminal act. But what "crime" did Hobson (or Mitt Romney for that matter) commit? On what and from whom did she "gorge"? For what buried indiscretion is her $25 million gift to a Chicago after-school program an attempt to atone? Bethany McLean is a skilled investigative journalist; if something were hidden in the past of Mellody Hobson, she would be capable of uncovering it. And if Hobson is representative of her class, of the highly educated and accomplished and well-meaning liberals of both political parties who chair corporate boards and fund nonprofits and appear on television and toggle between government and wealth management—and I think she is—then there must be many more fortunes behind which lie determined effort and luck than there are portfolios grown from illegality and deceit. Life is not a television show. The picture of ravenous and thieving wealth one finds in James Wolcott’s columns or in the pages of fashionable journals or on MSNBC is dramatic fiction; it’s drawn more from memories of Dallas and The Sopranos than from reality. And yet this imaginary conceit is effortlessly transposed onto the world of politics and morality, where it finds expression in denunciations of the "One Percent," of the wealthy that "don’t pay their fair share," of Republicans who are thought to privilege the strong rather than empower the weak. I have no doubt that if Wolcott or one of his fan-boys were to encounter Hobson and Lucas or Rogers or Bill Bradley in a social setting they would be nothing but courteous and solicitous, making small talk and attempting to display their wit and breadth of knowledge, perhaps even dropping hints of their latest projects in the hopes of winning a kind word or grant. How a change of partisan affiliation, all so meaningless in the upper reaches of society, can immediately shut down a liberal’s moral imagination, send him reaching into his messenger bag of potted quotes from Balzac and dimly recalled undergraduate Marxist economics, is more than a shame. It is an indictment. And it’s lazy. For there is an American establishment, a moneyed class with outsized influence in the shaping of tastes and policy, but the liberals are too busy binge-watching Netflix or condescending to hapless Republicans to examine it. McLean’s profile of Hobson provides an inadvertent guide for anyone interested in the subject of power not wielded by Terence Howard Wednesday nights on Fox. Read carefully, not only does it locate the sites of decision-making in our country, drop the names of corporate and cultural titans, and recite the credo of the influential. It also reveals the anxieties and weakness of our establishment. Power is earned and wielded and traded on the campuses of our most prestigious universities, in D.C., New York, Silicon Valley, Hollywood, Chicago, and whichever city is hosting this year’s TED. Work is rewarded in a meritocracy, but the most important factor in anyone’s career is luck. "Hobson’s connections have shaped her life," McLean writes, in a sentence that applies to every human being ever. What Hobson has been blessed with are connections to the insanely powerful and well off. Rogers introduced her to Bradley, who introduced her to Starbucks CEO Howard Schulz, who introduced her to Dreamworks CEO Jeffrey Katzenberg. She’s on the board of both companies. She met Lucas at a conference in 2005. When he asked her out, Hobson’s friend Arianna Huffington warned against it. "I said, ‘You can’t go.’ I thought he was a ladies’ man," which proves Huffington is wrong about everything. "On the surface," McLean notes, "Hobson’s circle of friends has the slightly artificial feeling of a consciously curated group of Very Important People." But McLean never proves that the surface impression is wrong: The names that appear in her composition make up a roster of the liberal elite. Sheryl Sandberg, Warren Buffett, President Obama, Rahm Emanuel, Richard Parsons, Craig Robinson, Louis Susman, David Geffen, Bill and Melinda Gates, and Harold Ford Jr. are either mentioned as friends or testify directly to that fact. When Hobson and Lucas were married at a private ceremony on Skywalker Ranch, Bill Bradley accompanied the bride down the aisle along which sat Oprah and Steven Spielberg. Bill Moyers officiated. It makes perfect sense when you think about it. "I have worked very hard to have my relationships be substantial," Hobson tells McLean, but there’s no reason for her to be defensive. It’s only because the reputations of her friends are so inflated that Hobson feels it necessary to say her relations with them have substance. And what does substance mean in this context, really, but sincerity? I don’t really believe Hobson and Arianna Huffington have all-night discussions of passages from Kierkegaard, though I could be wrong. But I have no doubt that they have a good laugh now and then and over a glass of wine speak to each other in the most authentic and impassioned terms about sustainable development and closing the skills gap and leaning in. When the "journalist turned vice-chairman of Kissinger Associates" Joshua Cooper Ramo turned up to relate a story about the big wedding, I couldn’t help but laugh: Only a fixture of the elite like Hobson could be friends with both Arianna Huffington and Henry Kissinger’s factotum. Author Dambisa Moyo says, in what has to be my favorite quote in the story, "Payne Stewart had W.W.J.D. [What Would Jesus Do?]. I have W.W.M.D." But honestly, Moyo is selling Hobson short. What does Jesus have that she doesn't? Moyo is not the only person quoted in the article who describes Hobson in religious terms. "When I think of her, I think of grace," says Schultz. Katzenberg adds that he gets "a little nervous about her because the words are so flowery," and one would have to be God-like indeed, I think, to make Jeffrey Katzenberg nervous. Sandberg, echoing Saul of Tarsus, says, "My life was altered by meeting her." A critical observer has no choice but to be skeptical of such praise, but as I thought about it more I realized these effusions were nothing more than signals of inclusion. One’s friends ought to give positive quotes to journalists; if they don’t, they’re not really your friends (you know who you are). And the encomiums tell us something about the character of this elite: friendly, welcoming to like-minded talented individuals no matter their race or gender, supportive of the in-group, and not necessarily suspicious of exposure or of embarrassment from the press, which is to a great extent part of the in-group. What Hobson and her friends seem most worried about is coming off as snobs. She may be up at 4 o’clock in the morning, she tells McLean, but "She and Lucas always talk at 7:30 a.m. Chicago time when they’re in different cities." One gets the impression that this happens a lot. Passing reference is made to the Lucas Museum of Narrative Art planned for the Chicago lakefront. McLean calls it a "monument to Hobson’s influence," but only hints at the controversy the design and development have engendered from the non-billionaire set. Lucas may actually have to move the museum, suggesting Hobson’s influence extends only so far. "George says to me, ‘We are normal,’" Hobson says. "And we are. We go to the movies every weekend. He likes to have the same experience that others do, so we don’t watch in a screening room closed off to the world. We go to the local theater in whatever city we are in." Then, in the closest McLean ever comes to irony, she writes that Hobson "tells me about one Friday night they ate at Sizzler." And there you have it: Don’t get all uppity about the mega-wealthy changing the world to suit their liberal preferences—the Hobson-Lucases go to the movies with the norms, and once they ate at Sizzler on a Friday night. I can picture the scene. George and Mellody ensconced in a leather booth, chatting about their reactions to The Fault In Our Stars as they decide between the Tri-Tip Sirloin and the Malibu Chicken Combo. George, with his permanent half-smile, a morsel of ketchup stuck to his beard, looks around the dining room in expectation of being recognized. When they return from the endless salad bar the couple chats about Steven and Sheryl and Valerie and Rahm, compares travel schedules, laments the grief the Republicans are giving the president, and wonders whether global warming will rob their daughter of the ability to one day buy a mansion in Miami. It is here, in this tableaux, as the billionaire and his wife try to fit in among the screaming children and teenage couples and senior citizens asking for a discount—Lucas is eligible, by the way—that we see most clearly what James Wolcott doesn’t grasp about the "very rich." Progressive, tolerant, ethnically and sexually diverse, they are nonetheless ideologically and culturally uniform, unable to treat seriously opinions not mentioned on the Huffington Post or on Charlie Rose, trapped in a performance of reverse-snobbery in which one re-establishes a connection with the public by spending an hour at a casual dining franchise. What worries me about the American establishment isn’t its venality. Its banality is far worse. This entry was posted in Columns and tagged Democratic Donors, Jeffrey Katzenberg, Media, Rahm Emanuel, Valerie Jarrett. Bookmark the permalink.